Back Porch Fabrics is located in an old warehouse which has been renovated and updated for retail use. 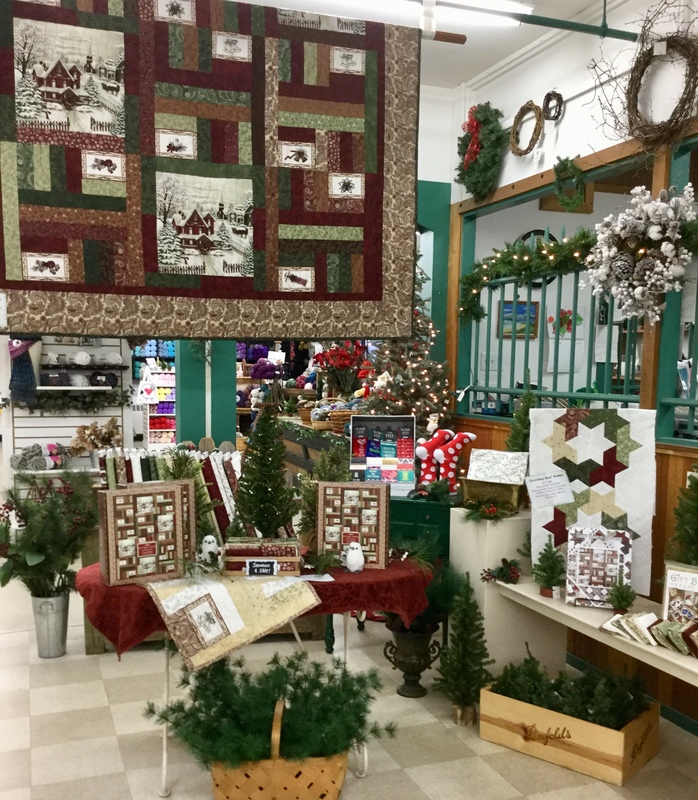 The warm, pine flooring, rough textured walls and high ceilings with massive support beams provide a wonderful backdrop for the colorful fabrics and quilts that fill the store. It is a full-service quilt store located on the Monterey Peninsula of central California. The shop has been in Quilt Sampler, 2003 and an Encore Shop, 2011. How has your store evolved since your first day? We are celebrating 23 years in business. Lots of changes have occurred in the quilting industry over time, however, we are still playing with fabric and having lots of fun. We sell inspiration by the yard! Running a quilt shop is like having a party every day but you don’t know who will be coming in and what they will bring to show us. What are the store successes you’re most proud of? My favorite part of owing a quilt shop is the constant new ideas for what can be done with fabric. I enjoy attending Quilt Market twice a year. I’m always looking for creative ways to sew with fabric and I usually find lots of books and patterns at Quilt Market. We stock and sell over 400 book titles. 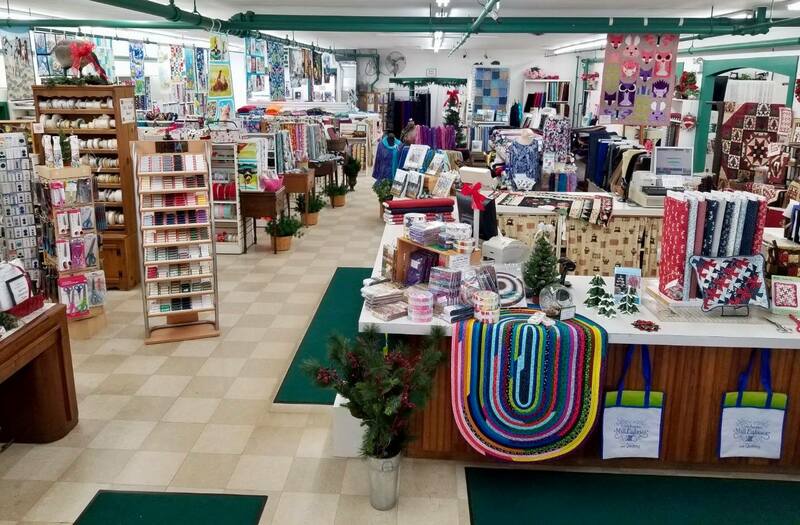 How have you created a quilting community through your store? Since we are located on the Monterey Peninsula in California between Monterey and Pebble Beach/Carmel, we get lots of quilters from all over the world. Our local quilters are very loyal customers and put on a quilt show each year two blocks from our shop. I always do a special on-going demonstration at our shop for customers attending the quilt show. The Empty Spools Seminars are held at Asilomar, one mile from our shop. We run a shuttle bus after classes to our shop. Each of the five sessions has over 150 happy quilters who spend the entire week with one teacher. I have learned a lot about choosing fabric to sell from the wonderful teachers and their students at Empty Spools. In 2014, I got to be Artist in Residence and spent the whole week creating a different quilt top each day from left-overs from different projects. I have also attended Empty Spools many times. Last year I took Kathy Doughty’s 60-degree shape class exploring triangles, diamonds and hexagons. How do you manage classes and teachers? Twelve super employees work part-time at Back Porch Fabrics. Some of them also teach classes in addition to four local teachers. Our local quilt guild brings in national teachers. Every month, Back Porch Fabric has a demo day. There is a Free quilt pattern and the demo shoes how to sew the pattern. There are two sessions and door prizes at both sessions, as well as show and tell. Customers just show up and enjoy the fun! When they attend four demos and bring back three projects made with Back Porch fabrics, they earn a gift certificate for a free class! Download the Saturday Demo information HERE! Can you explain what your Quilt Gallery is about? Our classroom also serves as a Quilt Gallery. We always have a quilt show on display. We usually feature talented local artists, and occasionally feature quilters with a national reputation. The large walls and high ceilings in our gallery accommodate even the largest quilts. We do six shows a year. Usually the show is local quilters, but we have also had several shows of work by Gwen Marston and Freddy Moran. Del Thomas (who owns many of Ruth B. McDowell’s quilts) will be showing quilts from her Contemporary Quilt Collection again this year. We just hung the quilt show. Our website hows current and future shows. QT Fabrics for making this feature possible. 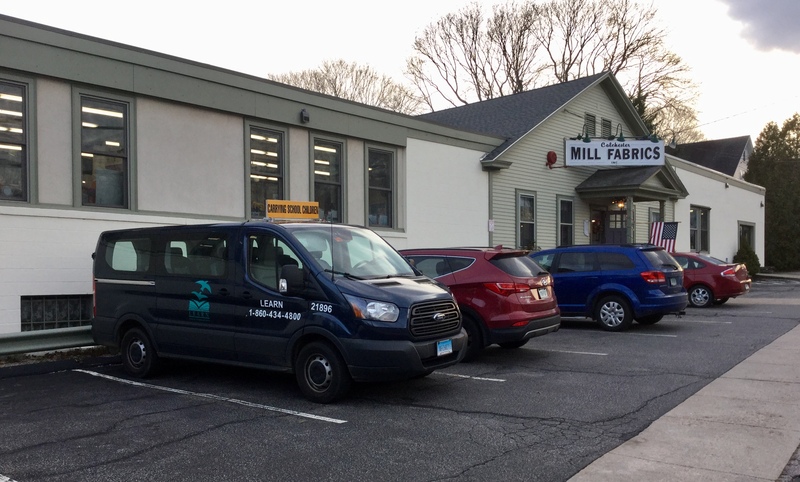 American Quilt Retailer is pleased to feature Colchester Mill Fabrics and Quilting of Colchester, CT, in today’s Open for Business blog post. Years in business: We will celebrate 44 years in business in March, 2019. Number of employees: I have eight employees. Three are full time and five are part time. 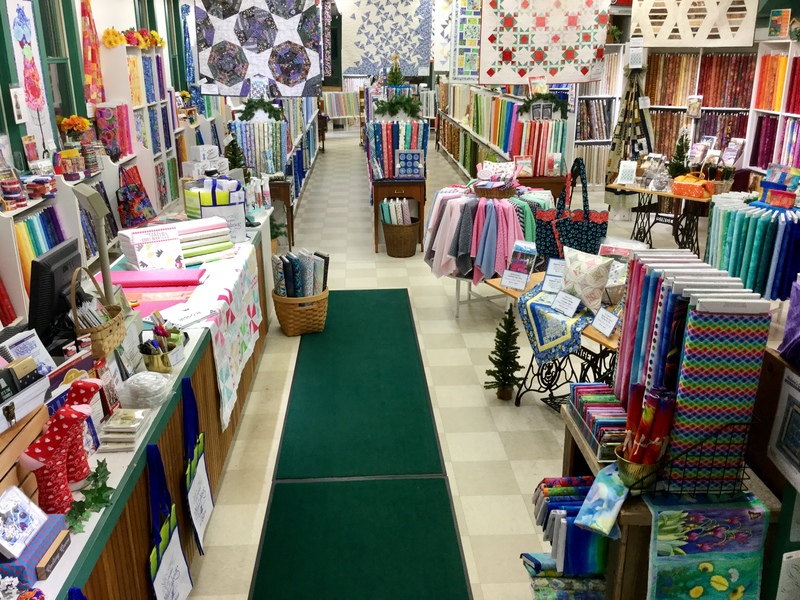 Types of special services offered — While we are technically a full line retail fabric store, our main focus is quilting. We offer services you won’t find in many other shops. We have on-site scissor sharpening, we can cut foam for replacement furniture cushions, we make bows from our ribbon stock or from customer’s own. We carry a wide variety of yarns and offer help with knitting and crocheting projects. We are in the former Levine & Levine Coat Factory building, a 16,000 square foot free-standing building that still has the old steam pipes and sprinkler system, which adds to the charm of our building. We are in the south eastern portion of Connecticut, thirty minutes from the capital, Hartford. We are 2.5 hours southwest of Boston and 2.5 hours northeast of New York. What is the history of your store? My mom, Carolyn, was a stay at home mom who made custom drapes, slipcovers and pillows for customers. She shopped at Colchester Mill Fabrics for supplies. She became aware the business was for sale, and in the fall of 1974, asked her mother-in-law for a $25,000 loan to buy the store. The store was purchased in March 1975 and she suddenly lost her lease. My Mom found a small strip mall that was on the main road and decided to buy the location. It housed several other businesses and as our business grew, the other tenants were asked to leave. Finally, our store encompassed the entire 8000 sq. ft.
We were truly the one stop shop and had customers coming for as far away as Rhode Island, Massachusetts and New York. We carried fashion fabrics, home decorating fabrics, trims, yarns, a vast craft department and every notion known to mankind. If we didn’t carry it, it wasn’t going to be found. 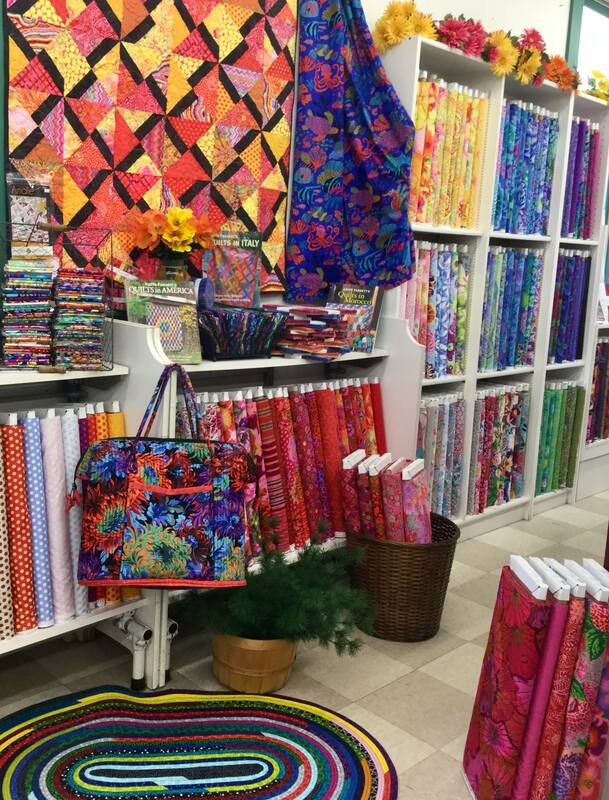 We traveled to NYC several times a year to Cranston Print Works to purchase fabrics. When quilting starting to become vogue, we started carrying calicoes and later batiks. On June 3, 1997, I was in NYC on a buying trip when I got a frantic call that the store was on fire. We had been burned to the ground in an arson fire. We had to decide what our future was going to be. The outpouring of love and support from our customers was overwhelming and Mom said, we had to reopen for them. Mom had a vision for a new store and spent days trying to make that a reality. She and my stepdad were driving through town and found that an old Harris Tweed coat manufacturing building was for sale. She brought me to look at the building which was “off the beaten path.” I took one look and started to cry. There was no way we could make this rundown, old, smelly building work for us. She pushed me to look past all the ugly. Exactly one year from the day of the arson fire, we opened in the former Levine & Levine Coat Factory building. We went from 8000 sq ft to almost 16,000 sq ft. We carried the same types of inventory in the new store as we did before but now had a more dedicated quilt department. With such a huge area to fill with product, we expanded in every department including having a classroom. Classes were a challenging and as new product came in, the classroom got smaller until finally, it was replaced with fabrics. Recently you changed from a fabric store to a quilting store. Why did you do that and what were the steps, and challenges, involved? When my Mom fell ill, I took a more active role in the day to day business. I tried to have my vision but it was still Mom’s store and she had final say. She passed away May 5, 2011. In 2016, we reduced the square footage devoted to our home decorating department by about half, we cancelled our 40+ year contract with McCalls pattern company, and we added a small classroom. 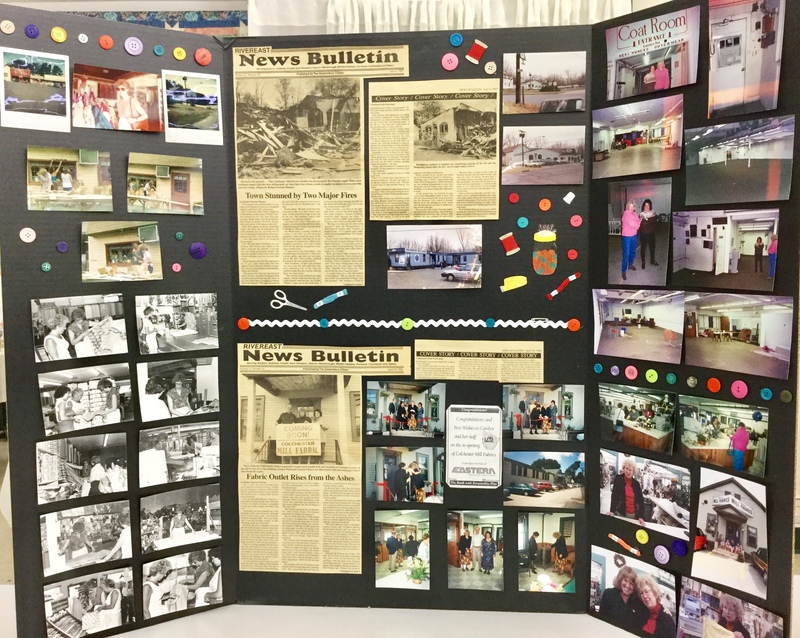 We brought more quilting type products, reduced the square footage that we devoted to fashion fabrics, and rearranged fixtures to allow better quilting type displays. The classroom now has 10 tables, a 18×20 rug, retractable electric from the ceiling, a 55 inch tv and space to comfortably seat 12 people for classes, and about 50 people for guest speakers/lectures. Mom’s voice is with me every single day. All these years later, I finally realized she was my mentor and without her, I wouldn’t have the amazing shop I have today. How large of an area does your customer base draw from? Our core customer base comes from all over Connecticut, but we draw from all the neighboring states including Massachusetts, Rhode Island and parts of New York. We are approximately 30 minutes from the shore, so tourist traffic is mostly summer traffic. We have great leaf peeping in our area, and we see an upswing of tourist traffic during October as well. Being 20-30 minutes from two casinos, we many customers that visit them. We’ve heard plenty of stories of wives leaving their husbands at the casino so they can shop with us. What makes your business great? We are much larger inside than what you see on the outside. First time customer stop right inside the door, eyes and mouth wide open, not knowing which direction to look first and just gasp. We carry nearly 5000 bolts of cottons from major manufacturers. We have patterns, books, batting, notions, and gifts for every quilter. Along with all the products, we have samples of many patterns on display as well as the kits to make them. We also carry fashion fabrics and designer fashion cuts from the New York and Los Angeles Fashion District. We also carry sewing notions, crafts and yarns. We also provide services such as scissors sharpening. We are happy to provide the environment that takes you to another happy place. You have a lot of great events at your store. How many do you have each year and how do you manage them? We try to have a big event each quarter. The event can be a guest teacher/lecturer, themed sale or a retreat. Each New Year’s Day we have a Pajama Party. If customers come in wearing jammies, they receive a store wide discount. Staff are required to wear their jammies to keep up the theme. 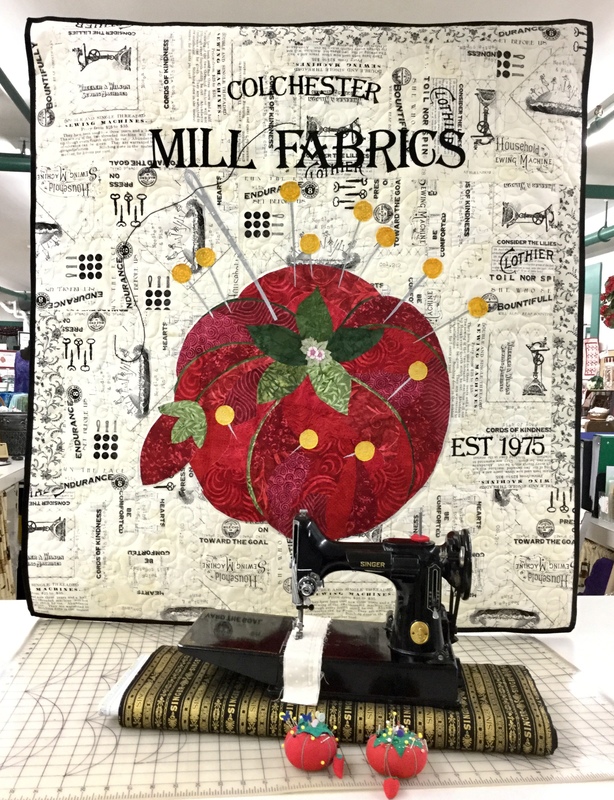 In recent years, we have hosted fabric and pattern designer Toni Steere from Wing and a Prayer Designs, and Timeless Treasures for a trunk show and a two day class. 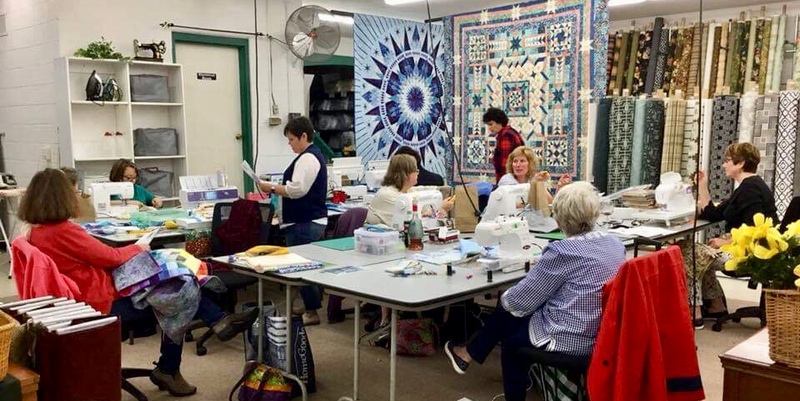 We have hosted former Connecticut resident, fabric and pattern designer Jackie Kunkel from CV Quiltworks for a trunk show. Alex Veronelli from Aurifil Thread taught us all about thread. We were entertained by QT Fabrics and learned all about their long history and everything we wanted to know about fabric printing. 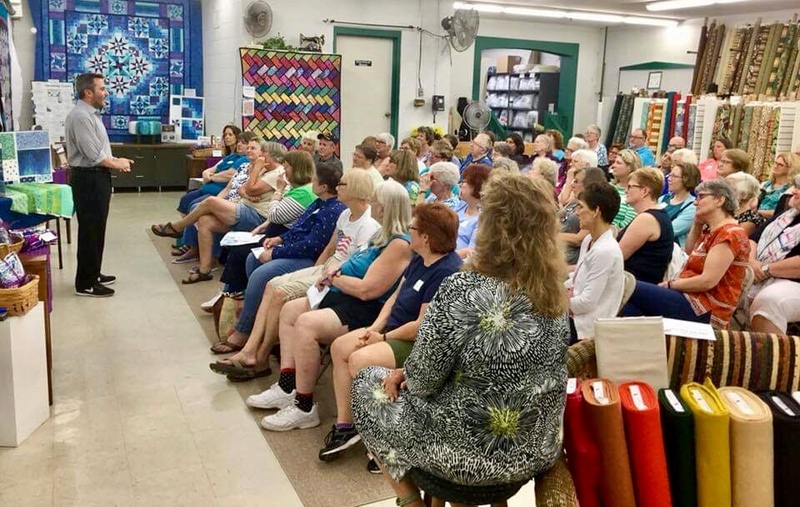 We recently had Sue Reich, a local quilt historian with the largest personal collection of historical quilts visit us for a very moving lecture about WW2 quilts and how they related to Connecticut. We hosted our first ever Quilter’s Camping Retreat this past October. We have a Spring as well as a Fall Retreat in the works for 2019. The key to a successful event/sale is cooperation from my staff, delegating when possible, and a wonderful customer base that appreciates what we do for them. What advice can you give other shops about how to run events? Organize, organize, organize and organize more. Myself and my manager, Liz have a wonderful working relationship. We both have vastly different strengths and we know how to work well off each other. Attention to detail is extremely important to us and while it can make for challenges organizing events, in the long run, it is a life saver for us. Expect the worst, plan for it and know that you can handle whatever situation arises. I have a large wall white board calendar that is updated weekly that I can glance at for advanced ordering as well as classes and details for trunk show arrivals and return dates. Because we are having even more events in 2019, I’m working on a yearlong calendar that I can events/sales for the year. This will allow me to see what months we have gaps in events/sales. I know I must work harder on my organizational skills this year. Do you take time off during the week or for vacations or travel? We are open seven days a week so I have scheduled time off. I rarely take more than an afternoon off, though. To stave off burn out, I travel to St. Croix 3-4 times a year to spend time at our condo. I’m extremely fortunate to have a wonderful staff and a bookkeeper who keep the store running smoothly. I have access to all aspects of my business while I’m out of the shop so I’m never truly away but I am able to step away and know the shop is in good hands. Do you bring in trunk shows from designers? We bring in trunk shows or new quilt samples from designers we find at Quilt Market. Right now, we have a trunk show from Pieces to Treasures, a lovely Moda designer from Australia that features patterns using dish toweling. We do base some of our fabric buying around a quilt sample offered through our fabric vendors. We will reach out to designers asking to borrow quilts. This saves me money by not having to have a sample made for display. It also allows our samples to change on a regular basis so we always look fresh. Does your area have shop hops? What is expected of you when you belong to a shop hop? For over twelve years, we’ve had a 12 shop Shop Hop, held every other year, in September. We meet several times a year to determine what we will feature during the Hop. 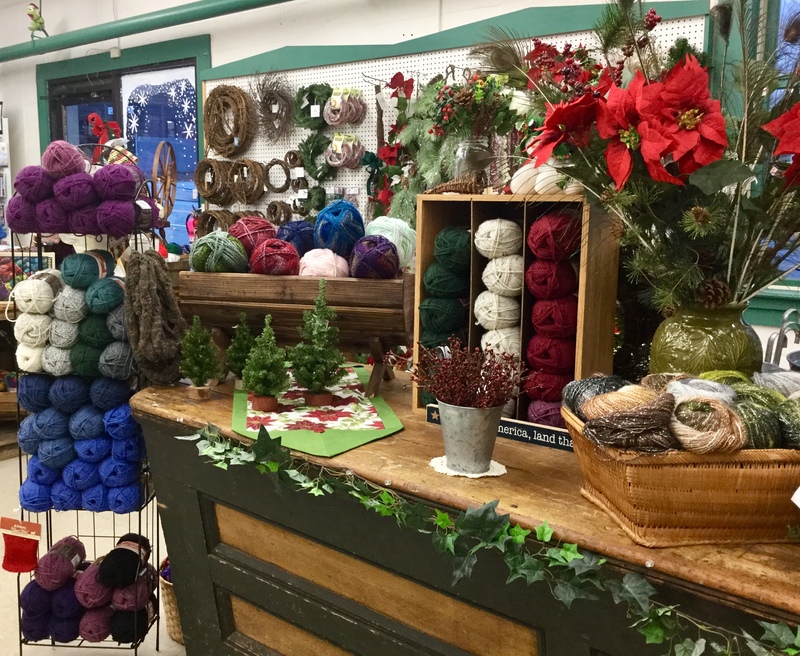 Each shop is expected to have a sample of their shop project on display, light refreshments and one or two sale items specifically for hoppers. Each hopper receives a free pattern for visiting each shop. We have our own quilt featured on the cover of the pattern we choose making each pattern that much more personal to the shop. In previous hops, we have given away sewing machines, huge gift baskets and shop gift certificates for completed passports. This year, we are having a party themed hop. Each shop will host a different themed event. Our theme is Country Fair and we plan to offer games like pin the thread on the machine, bobbing for fabric etc. What kind of advice can you give for creating displays? Having a large craft department helps us with products needed for displays. Being a very visual industry, our displays need to tell a story but not be so over the top that customers don’t want to shop the display. Various heights, colors, textures and shapes in our displays make a customer stop and see everything. I am a firm believer of signage. Customers need to know what they are looking at and not guess what pattern/fabric etc is used in a sample. We want our displays to make customer just have to buy something! My staff takes a vision I have and runs with it or I leave display ideas up to them. I was given the ultimate compliment from a staff member this week. She explained that a first time customer commented on what a wonderful first time shopping experience she was having, that she doesn’t have a boss but has a leader that truly appreciates her staff. Appreciate your staff and let them know it often.